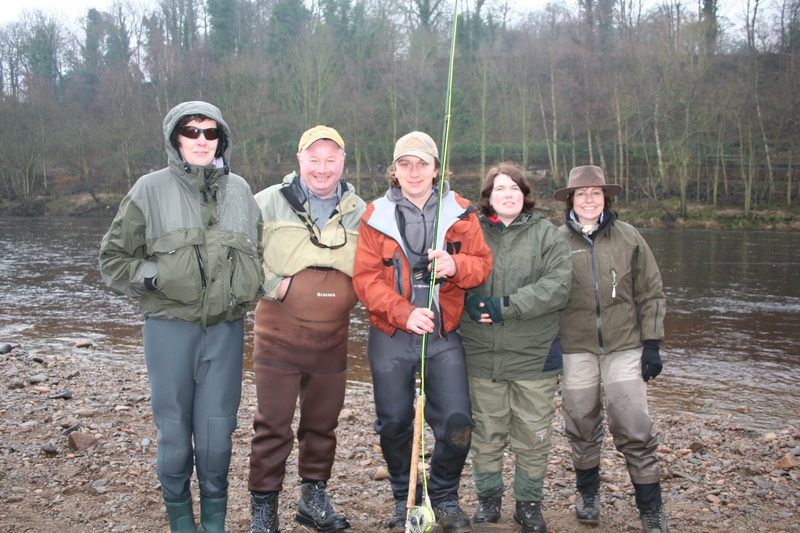 I had the pleasure of seeing Jim today with a group of friends from a local fishing club on a private stretch of water on the Tyne. 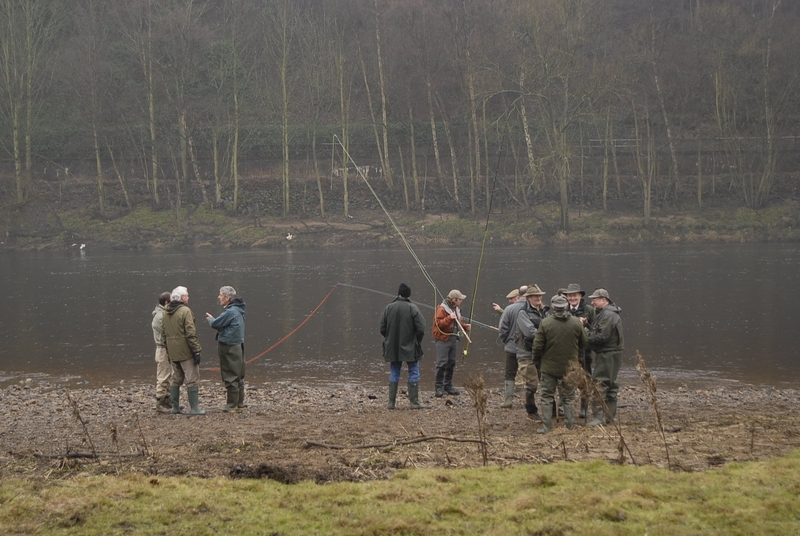 This is something that is organised every year by a local fishing shop in Morpeth. 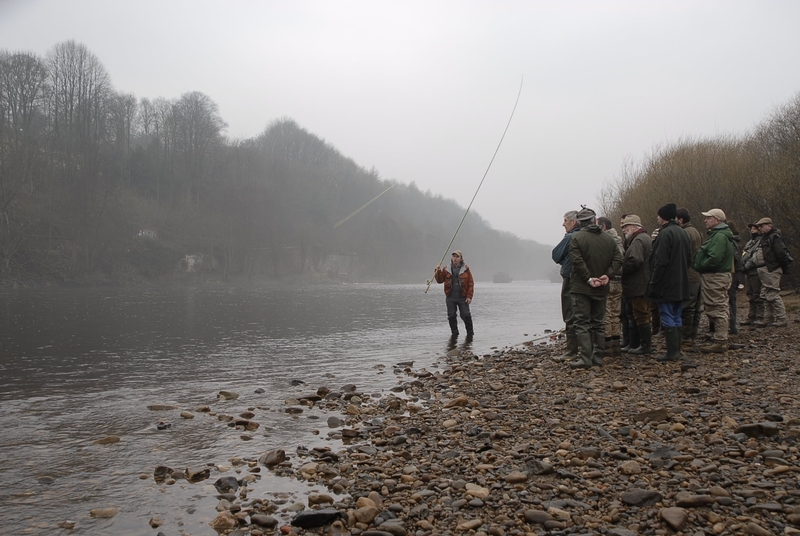 Around 20 people attended eagerly waiting for Jim Fearn’s demonstration on the double handed rod. This is the first time that I’ve seen Jim demo outside AAPGAI open days doing his full time job, working for Guide Fly Fishing. I know that Jim is a good communicator but seeing him at first hand with a range of abilities from a lady beginner to experienced fisher folk and how he engaged everyone with his effortless style. Jim demonstrated with ease shooting heads and Skagit lines. Skagit are a popular line in the armoury of todays fly fisher’s tool kit, fishing heavy tungsten tips and line to get large tube flies into the “fish zone” quickly. Ideal for catching a springer on “fly only water” (which Jim and Tony Riley did very recently on the Dee). This line was popular with the audience after the demonstration and Jim was kept busy spending individual time with the majority of the members. He explained in easy language how to perform roll casts, single spey, snap t, circle and perry poke, going into detail about the benefits of a perry poke, bringing the audience right into close proximity as we became the trees on the bankside, again effortless explanation and selling us all the benefits of why we should try a perry poke. Jim stayed to the end and ensured that everyone that attended was offered one to one tuition with him. « AAPGAI off to Patagonia …… !